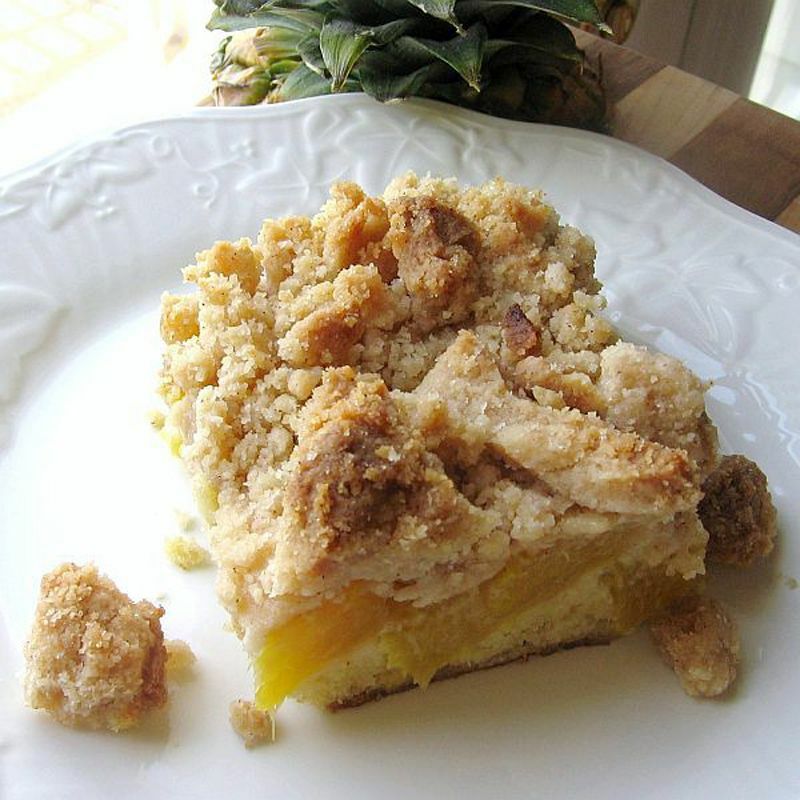 This simple Polish pineapple crumb cake―placek z ananas y kruszonka (PLAH-tsek zah-NAH-nahss ee kroo-SHOHN-kah)―was a favorite of my maternal busia. She had never had pineapple before emigrating to the States even though it was being eaten in Spain as early as the 1500s. As you might expect, it was only available to the aristocracy and gram was definitely of peasant stock. With her first taste of this tropical fruit, she was in love. She adored pineapple in upside down cake and this simple, moist coffee cake dessert that can be served after any meal (or at breakfast). This recipe calls for 1 whole egg and 2 egg yolks. Freeze the leftover egg whites and save for leftover egg white recipes. To peel the whole pineapple, cut off the crown and the bottom. Stand the pineapple upright and, using a sharp chef's knife and a sawing motion, remove the tough outer skin, all the way around. Slice the pineapple in half vertically and remove the core from both halves. Cut the halves into 1/2-inch thick half-rings. Cover with plastic and reserve. Prepare the crumb topping by mixing together flours and 1/3 cup sugar and 3 tablespoons packed brown sugar in a large bowl. Cut in butter as you would for pie dough until large crumbs form. Transfer crumbs to another bowl and reserve. Place rack in center of oven and heat to 350 F. Coat a 9-inch square pan with cooking spray. In the same large bowl, you used to make the crumbs, prepare the cake batter by creaming together 4 ounces butter and 2/3 cup sugar with an electric mixer until fluffy. Add the whole egg and egg yolks one at a time, beating after each addition. Add vanilla and beat on medium speed 30 seconds. Add the sour cream and mix until blended. The batter will look curdled and this is OK. In a separate bowl, combine 1 1/4 cups flour, baking powder, baking soda, and salt. Add the flour mixture to the batter and beat on low speed for 30 seconds, then on medium for 1 minute or until thick and creamy. Pour the batter into the prepared pan. Arrange the half-rings of pineapple overlapping in two rows on top. Place any remaining half-rings in the spaces. Sprinkle evenly with crumb topping. Place pan on a baking sheet and bake 50 to 55 minutes or until toothpick tests clean. Let cake cool in pan 30 minutes, then cut into squares and serve warm or at room temperature. Source: Adapted from a recipe by Victoria Durski and from Beth Hensperger's "The Best Quick Breads" (Harvard Common Press, 2000).